In Allison Schulnik’s hands, paint becomes matter and subject becomes object. Her paintings are about a continual state of flux: morphing, dripping, and melting. The work is several inches thick with oil paint, squeezed and laid onto the surface, oozing over the sides. With certain passages of paint, her work edges into sculpture. Her approach is playful but rigorous: there is accuracy in how she marks forms, despite the gooey directness of her paint application. She takes on a collective girl culture of unicorns, cats, carpets, and flowers, and reinvents them from a feminist perspective. She constructs a world full of female heroines, where centaurs become centaurettes, and mermaids have legs – and vaginas. Schulnik is presenting a similar transposition: she freely and unapologetically re-imagines fairy tales and rescues the protagonists from the hyper-sexualized, objectified Disney versions of themselves. Indeed, Schulnik’s relentless focus on the morphing of her characters becomes a statement about characteristics we associate with women: openness to change and ability to shift and empathize. She links them to strength, visually and narratively. The fluidity and density of the paint, along the subject matter and focus on elements like eyes, teeth, fur, and hair, suggests references to ritual power objects. Although this exhibition at Zieher Smith is entirely comprised of paintings, Schulnik is known also for her stop motion and claymation videos. She has a background in dance, and is a musician. The handmade claymation videos also utilize continuous and constant morphing. The characters in “Mound” (2011) stretch and mutate, droop and melt. “Eager” (2014) begins and ends with a body moving much like a modern dancer, crawling and shifting and multiplying across a dark stage set. 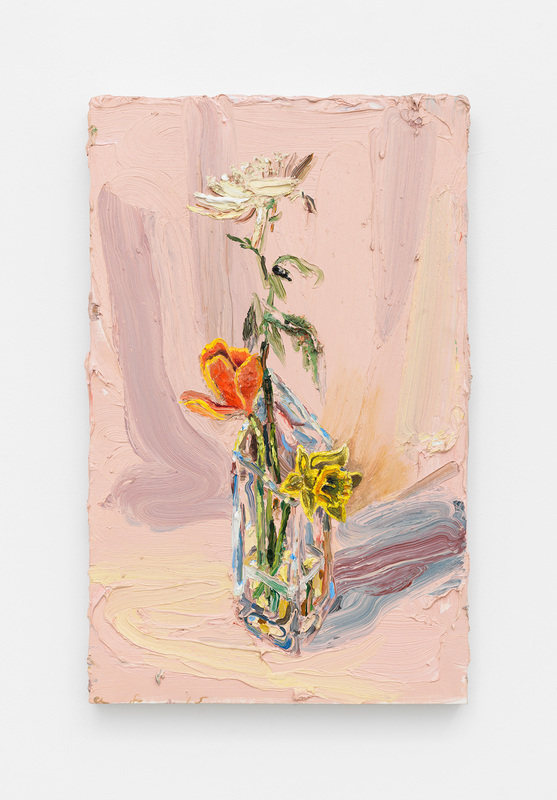 The current exhibition at ZieherSmith consists of two large-scale pieces with a fleshy, pastel, Silly Putty-like palette; two dark-ground paintings with self-portrait figures; a group of smaller still lifes of flowers and ceramics; and “Gin #14” (2016), which is arguably the star painting in the show. In the two pink paintings, Schulnik shows unicorns presiding over surreal, force-field landscapes. In “Centaurette and Unicorn” (2016), the landscape is punctuated by what looks like a testosterone-charged squirrel and rabbit. The unicorn, with its halo-encircled horn, rears up its hind legs as if battling evil forces, surrounded by impasto patterns and circles, decorative landscape elements, and full-to-bursting, overdone blooms. In “Two Long Unicorns” (2016), Schulnik locates power in one unicorn’s hoof. She calmly blows fire at her opponent (although in Schulnik’s hand and palette, the fire reads like air.) The palette she uses in these paintings is highly particular – blond and sandy, narrow in its value range. As much as she is rescuing characters from their Disney incarnations, she is also rescuing our color associations from pastel girl-pop culture, and transferring it to the site of a nine-foot long painting. The two black paintings are loosely self-portraits, with the kind of non-heroic heroism that characterizes her work at large. In “Gin #13” (2016), Schulnik shows herself sitting on a patterned rug in overalls, holding a cat. She lifts the cat away from her body, so that it looks like a droopy, elongated pelt more than a beloved pet. But it is such a familiar scene that it feels domestic and quotidian, as much as it is odd. 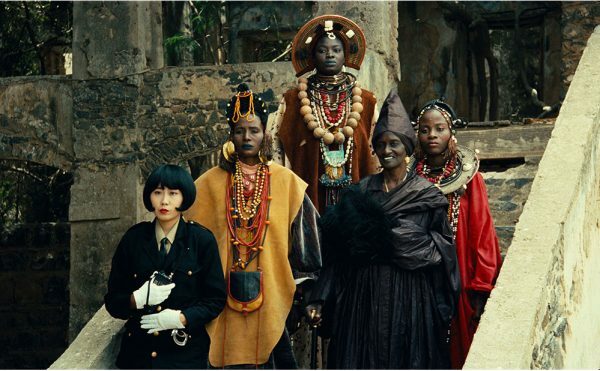 In “Lady” (2016) she transmutes herself into a knobby, barefoot crone, with oversized eyes and lashes, wearing a cowled cloak on top of her artist-worker garb of overalls and striped sailor shirt. Schulnik turns gravity into a force in her narratives and in her surfaces – animals and bodies sink, dissolve, and return to inchoate matter. 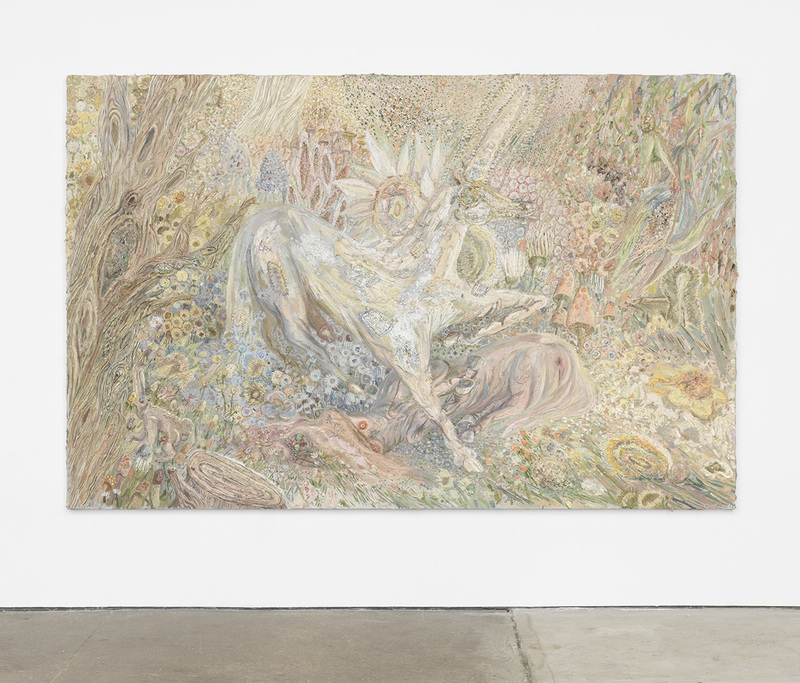 Her use of impasto and tilted planes (rugs, landscapes) insistently endow the objects she paints with an equivalent heft and tactility to their real-life counterparts. In “Gin #14,” which shows a cat lying on a patterned carpet, the paint becomes the nubby texture of the rug. The painting becomes a textile as much as it represents one. “Gin #14” is a bridge between the darker and lighter paintings, and also between the large-scale work and the smaller still lifes of flowers in vases and a ceramic cup. It is also the most direct and straightforward piece in the show — it’s just a cat painting, after all — with forms clearly articulated, even as the cat sinks into the texture of the rug. But, most interestingly, I find that Schulnik is able to take on the history and language of bravura paint handling and scale (Larry Poons comes to mind) without much ceremony. These are not loud, spectacular paintings. 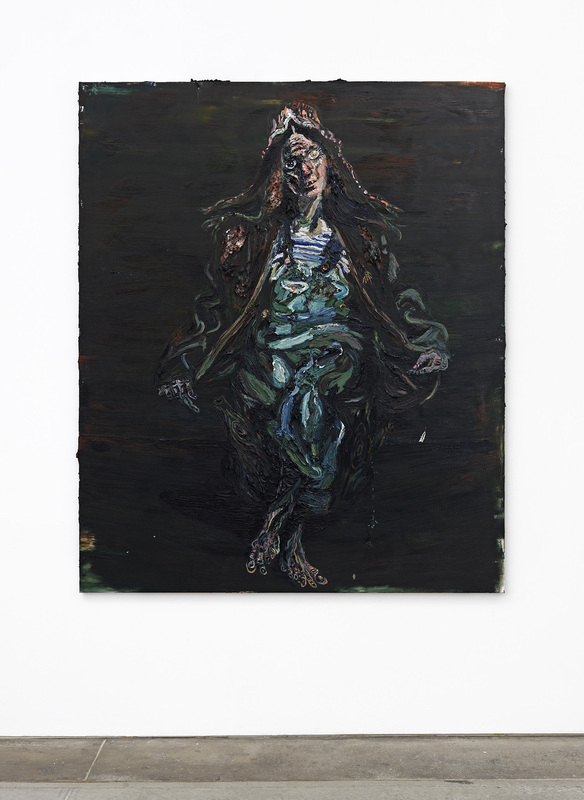 She uses impasto paint handling as a signifier of earth, guts, and skin, rather than a signifier of prowess. 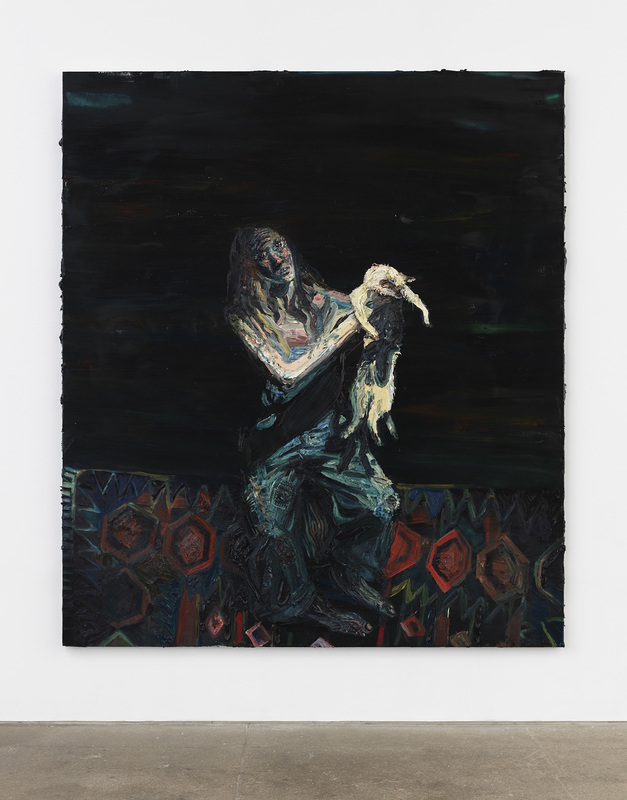 Allison Schulnik: Hoof II continues at ZieherSmith (516 West 20th Street, Chelsea, Manhattan) through October 8.